Every now and again a company will make a pair of boots and they will make you think two things. Why? And then, if you’re a certifiable boot loon quickly follow that up with, you know what I kind of want to get a closer look at them, and see what they’re all about. 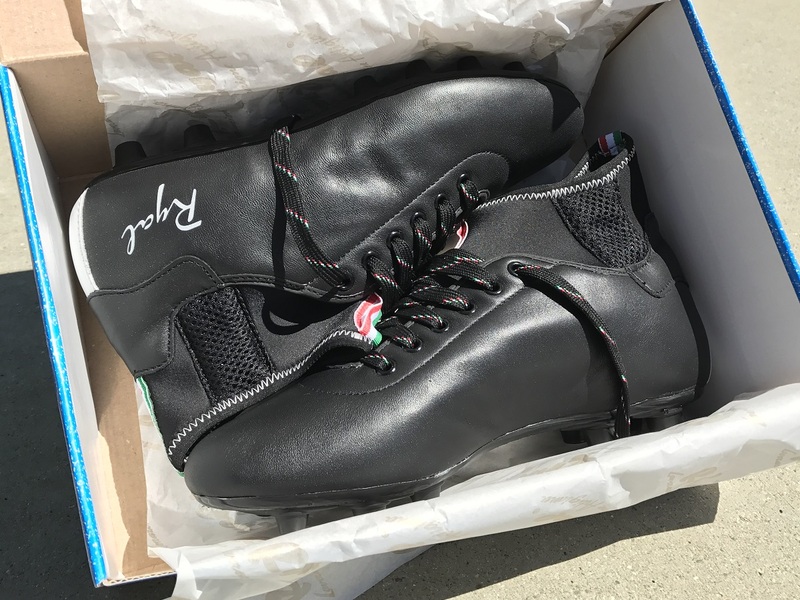 Which is exactly what I did when noted niche Italian purveyors of handmade football boots Ryal; announced their newest boot the Dribbling, a heritage boot with a mid-cut collar. My initial impression was covered in a post asking if the boot was actually an April Fools gimmick. This was followed up by some in depth discussions between Bryan and myself regarding the merits of the boot, where I said “you know what I kind of want to get a closer look at them, and see what they’re all about”. Lucky for me Ryal were keen to get a pair out, so from Italy to the Niagara Region by way of California they ventured. At which point all I had to do was wait for the lousy Smarch weather, to pass before I could get the out on the pitch and see what they were all about. If you’re keen to get your hands on the Dribbling it’s not entirely the easiest boot to procure. Retailing at €135 (or about $150 US ) making them the most expensive boot Ryal offer, they are available by request, so long as your foot is somewhere between a US size 7 to 13. So, what do you get for your €135? 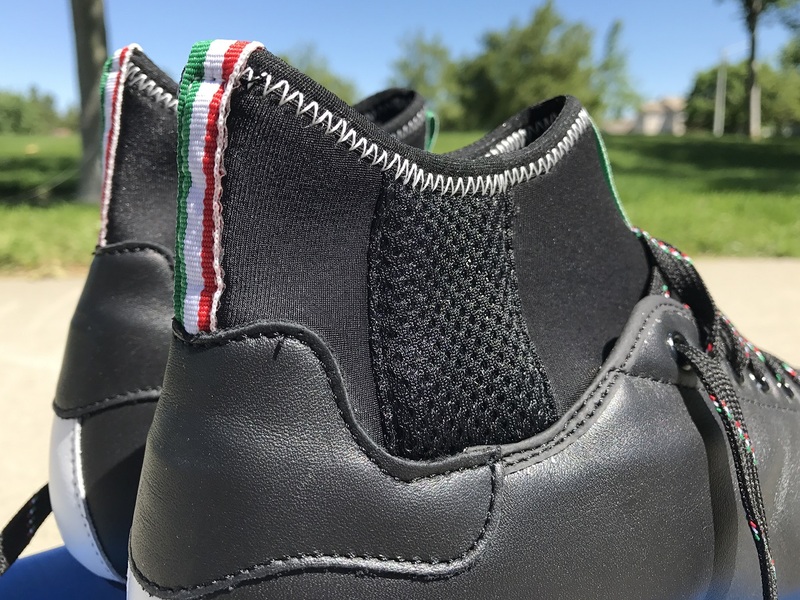 A super flexible classic conical soleplate, teamed with a water repellent Kangaroo Leather upper that is super soft to the touch, and a tongueless design thanks in part to the “neoprene technical sock”, which forms the boots collar. Also you’re getting a boot which is handmade in the somewhat (it does have that collar) classic Italian style from a manufacturer with over 70 years off cobbling experience, in the Tuscan town of Fucecchio. And when’s the last time you were able to say, your boots had been custom made for you? It’s fine take your time, I’ll wait. The first impression with the boot in hand is the same as right now when I look at the Dribbling. It’s such a weird looking boot, and it’s going to win no prizes for attractiveness. I even spent the first hour or so studying whether or not I’d be able to modify the collar like some players do on other collared football boots; and discovered that wasn’t really an option. But then again I’m supposed to be working with what I’ve been sent, not trying to modify it so it’s more aesthetically pleasing to me. So long as it does it’s job on the pitch we shouldn’t be too bothered if it’s not really a looker when it comes to attractiveness. The pair which Ryal sent out were listed as a EUR 42 which roughly translates to being a size 9 US; and I feel comfortable saying that they run a smidgen long. Is it long enough to advise you to order down in size? That would depend how tight of a fit you like, should you decided to go down a half size you’ll get the natural stretch over time from the kangaroo leather upper. But for me, there wasn’t any issues at all with the length of the boot. As far as width is concerned, it is definitely a boot suited more to the medium width foot. That being said, if you have a wider foot, you shouldn’t have an issue because the leather will stretch laterally and offer a comfortable fit. But if you have a narrow foot, it’s not something I’d recommend for you. When it comes to breaking in the boot, it’s all a matter of how much time you have. If you have the opportunity to use a couple of training sessions to allow the leather the chance to break to the shape of your foot, then that’s definitely something you should do. However, if your short on time, you won’t be dealing with a painful experience to go right from the box to the pitch. 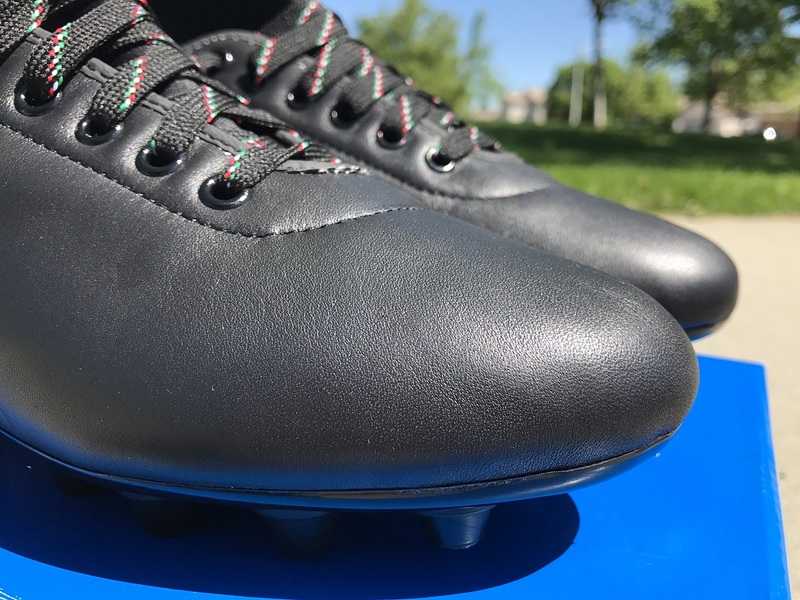 A brief aside, the neoprene collar of the boot actually extends into the boot to the point where the interior heel liner is actually made of neoprene, it’s not something which affects the fit or function of the boot it’s just something which is different to any heel liner of any football boot I’ve worn. Let’s deal with the most important question regarding the Dribbling. The neoprene technical sock, does it serve any technical purpose whatsoever? If you answered yes; sorry about that, but there’s no technical purpose to the mid-cut design and this boils down simply to the materials used. Unlike the mid-cut collar on a boot from the big three which tends to be made from a knitted material which gives the collar more flex and the ability to stretch so you get a locked down fit on the ankle. 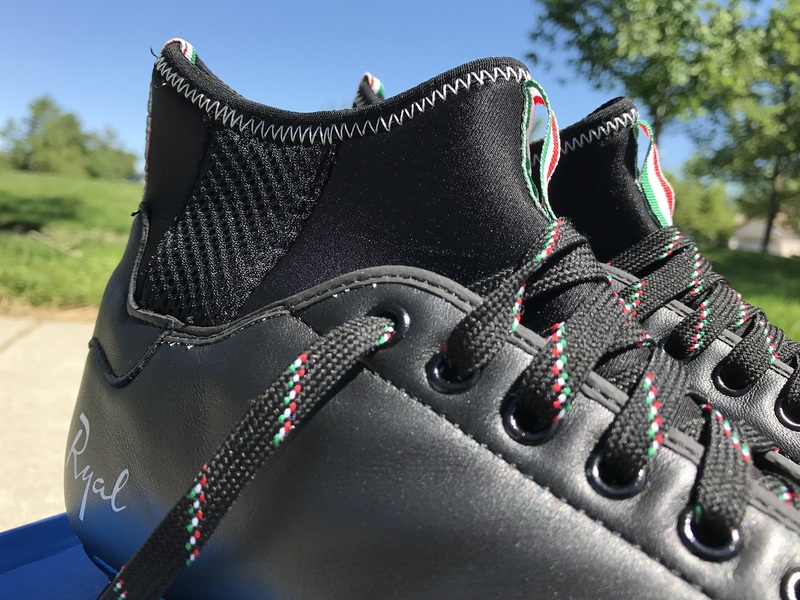 Unfortunately, neoprene doesn’t allow the same kind of fit or feel, it will stretch certainly, but it begins life too wide to offer a locked in fit when on foot, so it is purely decorative. 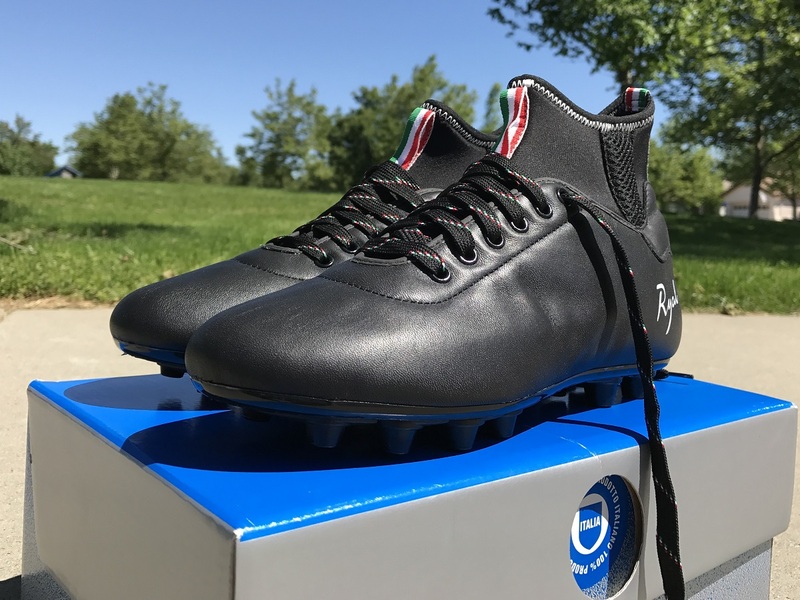 Now that PSA’s out of the way, lets get into what handmade Italian boots are all about; the leather, and I can tell you that the Dribbling isn’t let down here. You’re treated to a one piece water repellent kangaroo leather upper which is going to give you no nonsense classic touch on the ball. 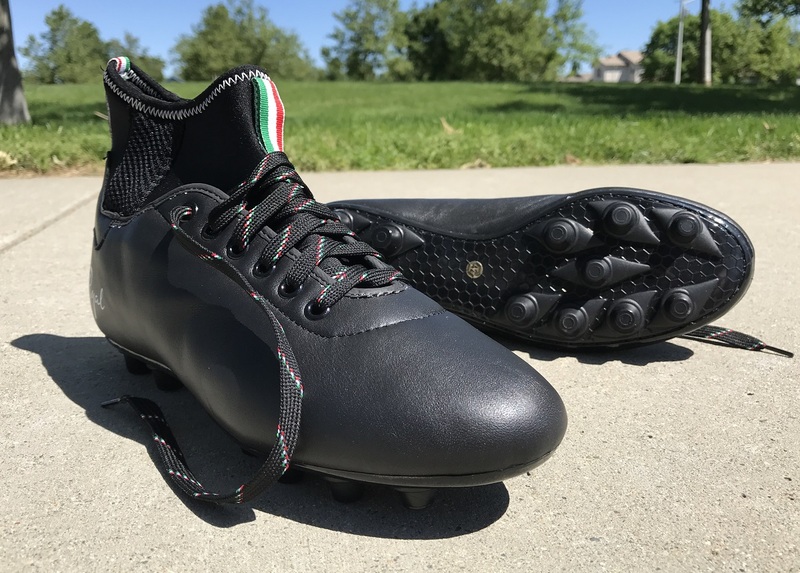 If you’re the type of player who likes minimal interference when you’re on the ball, you’ll enjoy the touch provided by the Dribbling; the upper is slightly more padded than other handmade equivalents such as the Pantofola d’Oro Lazzarini or the Akuna Cinquestelle Colibri. The slightly more padded upper is nice when you decide to let rip and have a solid crack on goal, as it’s more comfortable than the modern synthetic uppers we see all over the market. Traction-wise, we’re classic all the way, a 12 conical stud soleplate which as we all know is the best system to have on any pair of boots. It’s quality on grass and on artificial grass, it might not be the most explosive in terms of front line speed, but it’s definitely the most reliable pattern available, in my humble opinion. If you happen to pick up a pair of the Dribbling for yourself, first thing you’re going to want to do is replace the insole (pictured above) as it’s arguably the thinnest and least suitable insole I’ve seen in a boot (and yes that does include SL insoles). Now unlike the the Akuna line you’re going to need a new insole otherwise you’ll be in for a bit of an uncomfortable ride on more solid pitches. Thankfully I had a spare set of comfort insoles from another boot lying around and they fixed things right away. But something better than wafer-thin Styrofoam, would have served well here. A little food for thought future Ryal. The Dribbling is a weird boot. I mean it’s entirely unnecessary, in that it deviates so far out of the norm for Ryal, it’s almost silly, especially when you consider the marketed party piece serves no purpose whatsoever. But at the same time I suppose it’s kind of a cool boot for the collection. I mean I don’t know how many of them Ryal will end up making considering they are only available by request. If I had $150 to spend and was looking for something of the handmade variety would it be my first choice? If I’m entirely honest, no, as I’ve been pining for a pair of the Ryal La Storia for a solid 5 years now, but if you can get past the collar, the leather is top quality, and at the end of the day that is the most important thing when it comes to a leather boot. What are your thoughts on the Ryal Dribbling. A step too far for a classic brand? Or a sign of things to come? This reminds me of a boot I remember seeing as a kid at a Washington Diplomats – Minnesota Strikers match. There was a guy on the Dips who was wearing high top boots – Puma I think. It was probably a football or rugby cleat but I've never forgotten it since it looked so odd in soccer. An old school boot with a high ankle.